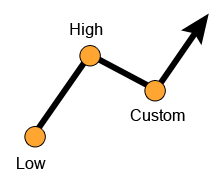 In order to calculate the Fibonacci retracements and extensions, simply fill the values of the highest point, the lowest point and if required the custom point in the cells below. 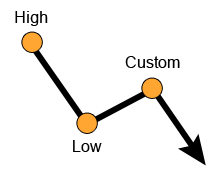 Select if you would like to see the uptrend or downtrend results. Press the Calculate button each time for uptrend and for downtrend. For example. Let’s assume that the price of an instrument (i.e. EUR/USD) in a given period extended from 1.5000 to 1.9000 and then retracted to 1.7000. You should enter 1.5000 as your lowest point, 1.9000 as your highest point and 1.7000 as your custom in order to make the calculation.